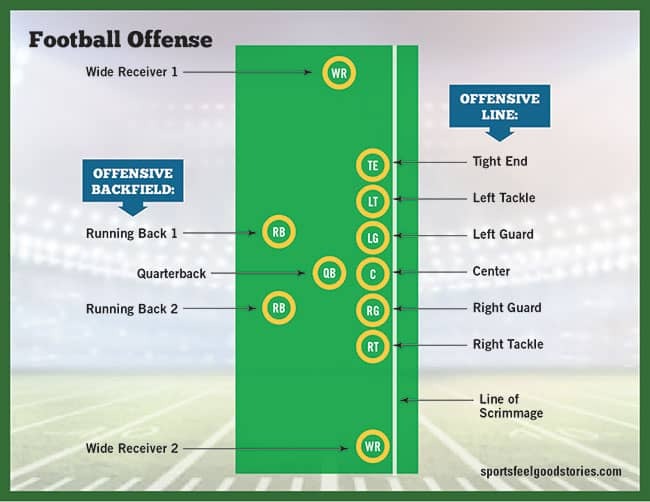 Understanding all of the football positions on offense and defense is one of the more difficult things to do for a new football fan. With so many players on the field and similarly dressed, it’s difficult. By understanding these roles on the football field, you begin to gain a better understanding of the game itself. This includes the strategies and tactics teams employ to gain advantages. A football team is made up of three core units: offense, defense and special teams. Within each of these units, players’ roles and responsibilities are defined by their position on the team. This article explores the structure of a football team and describes the player positions and how they interact to achieve the overall team goal of winning football games. By rule, a football team can have 11 players on the field at any given time. Teams assign players specific positions, or roles, to play. 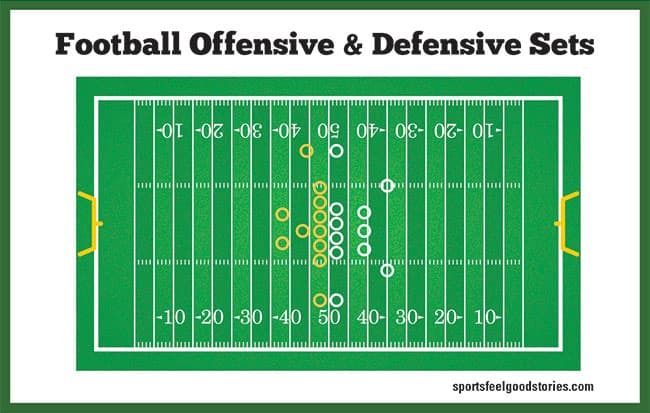 These positions are defined by the three divisions within each team: the defense, the offense and special teams. You might like: NFL Logos Ranked Worst To First. The defensive unit on a football team consists of three core areas: the defensive line, the linebackers and the secondary—or defensive backfield. In college and professional football, the defensive team is led by the Defensive Coordinator. The Defensive Coordinator, along with the Head Coach, is responsible for the strategy and execution of the defensive team, as well as in-game play calling and decisions. The job of the Defensive Coordinator and his players is to stop the opposing team’s offense by turning the ball over to their offense. This can be accomplished by either tackling them short of the line to gain, or by taking the ball away. This is done by interception or fumble recovery. Ultimately, the defense attempts to keep the opposing team from advancing the football down the field and scoring a touchdown or kicking a field goal. The group of players on defense that set up nearest the line of scrimmage is called the defensive line. Usually three or four defensive linemen (depending on the defensive scheme) line up across from the offensive line with their hands on the ground. Each defensive lineman sets up in a three-point or four-point stance before the snap of the ball. They typically place either one or two hands on the ground. 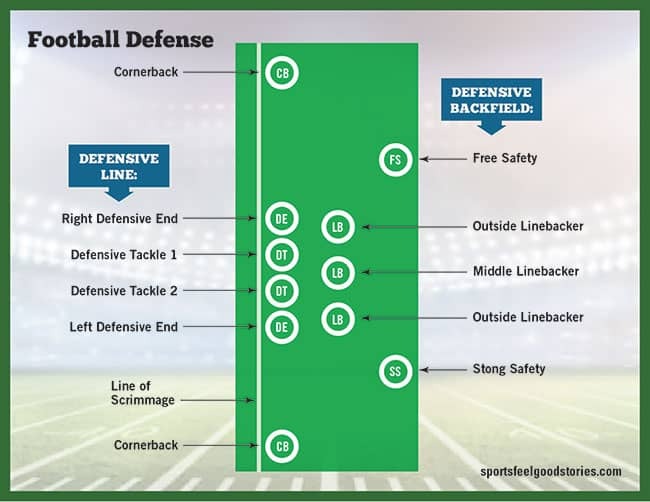 Common defensive sets include the 4-3 and the 3-4, so-called for the number of players on the defensive line and the number of linebackers behind them. The defensive set is determined by the Defensive Coordinator as part of the overall defensive scheme. The defensive line usually includes two defensive tackles positioned in front of or near the center position of the offensive line. Flanking the defensive tackles are two defensive ends. The defensive ends line up on the outside of the defensive tackle position on either side of the defensive line. Their job is to rush the passer and sack him behind the line of scrimmage or tackle ball carriers advancing upfield. The position requires speed and strength to maneuver around blockers and make tackles. Typically, the most talented defensive end on the team is positioned on the right side of the defensive line to take advantage of a right-handed quarterback’s blind side. The defensive tackle, sometime’s called a defensive guard, plays at the center of the defensive line across from or near the offensive center position. The job of the tackle position is to rush the passer and stop running plays at the interior of the line. In the 3-4 defense, the player lined up directly in front of the center is called a nose tackle or nose guard. While in the 4-3 defensive alignment, the tackles position themselves on either side of the offensive center. In addition to tackling responsibilities, defensive tackle and defensive end positions both use their height and jumping ability to knock down passed balls thrown by the quarterback. Moving away from the line of scrimmage, the next defensive group is the linebackers. The linebackers can consist of 3 or 4 upright (without hands on the ground) players behind the defensive line. Their job is to tackle offensive players advancing the ball, rush the passer, cover receivers and create turnovers. The middle linebacker, or “mike linebacker”, is the inside linebacker since they position themselves towards the inside or center of play. The outside linebacker usually plays towards one side or other of the defensive set. Sometimes they are called strongside or weakside linebackers, depending on the offensive use of tight ends. When a tight end is used on offense, a strongside linebacker, or “sam linebacker”, defends the tight end side of the offense. The weakside linebacker, or “will linebacker”, lines up on the side without a tightend. Responsibilities include blitzing the quarterback and/or covering receivers out of the backfield. Speed and athleticism are required for the cornerback position. The cornerback lines up across from offensive receivers and attempts to disrupt or intercept the passed ball. On rushing plays, the cornerbacks attempt to contain the runner and make tackles when the ball carrier gets past the defensive line. Sometimes a lineman or linebacker can be removed so the defense can use an extra defensive back, called a nickel back. The position is so-named because it is the fifth defensive back on the field. By adding one more nickel back to the formation (in place of another position), the defense employs a dime package. The second nickel back is sometimes called the dime back. The last line of defense are the safeties, in that they are furthest from the line of scrimmage. Their job is to assist in pass coverage with cornerbacks and make tackles. There are two types of safeties, the strong safety and the free safety. The strong safety usually performs a role similar to the linebacker, providing support against run plays and playing closer to the line of scrimmage. The free safety is more like an extra cornerback, quick and able to defend against deep pass plays. The offensive unit of a football team consists of the offensive line, the offensive backfield (including the quarterback and running backs), the tight ends and wide receivers. The offense is led by the Offensive Coordinator who, along with the Head Coach, determines the offensive strategy and calls plays during the game. When a team’s offense is on the field, they take control of the football and attempt to move it downfield and ultimately score a touchdown or kick a field goal. The football can be carried by a runner or a quarterback can pass the ball to a receiver to gain yardage. The quarterback is the “general” – and the most important player – of the offensive team. He communicates the play call to his team in the huddle and is responsible for distributing the ball or in some cases running it himself. The quarterback stands directly behind the center (or “under center”) to receive the snapped ball. Alternatively, he may stand several yards back from center in what is called the shotgun formation. Once the ball is snapped play begins and the quarterback may pass, run or hand off the ball. If the quarterback approaches the line and sees a defense that does not match favorably with the called play, he may call an audible. He can check out of the play by using hand signals or verbally calling out, letting his team know the new play to run. Behind the quarterback are the running backs. They are responsible for taking a handoff and running upfield to gain yardage. Other responsibilities include catching passed balls and blocking to protect the quarterback. There are different types of running backs. A tailback (or halfback) is a lighter, quicker style of running back. A fullback is larger and stronger. He does more lead blocking for the halfback and blitz protection for the quarterback. Faster running backs with the right play calls force the defense to cover more of the football field. A football field is 53 and 1/3 yards wide. (Check out more about football field dimensions.) This can tire defensive players out and make even routine plays more difficult. The pass catching specialists on the football team are the wide receivers. They run routes downfield so that the ball can be passed to them. During run plays and screens they may also act as additional blockers. A wide receiver who lines up on the line of scrimmage (but toward the sideline) is called a split end. If he lines up off of the line, he is a flanker. If a specialized receiver is used between the wide out and the offensive line, he is called a slot receiver. The slot receiver usually runs inside routes and shorter patterns across the middle of the field. The tight end is a pass catching position along side the tackle position on the offensive line. They are usually large, physical players who can play the role of an offensive lineman, but also have soft hands for catching the ball. The tight ends can stay home and block for running and pass plays, or they may run a route just like a receiver does. Depending on the offensive set, there may be one or two tight ends used at any given time. The offensive line is made up of five core players: the center, two guards and two tackles. Their job is to protect the quarterback from rushing defensive players, block for running backs and give the quarterback enough time to make a successful forward pass. The offensive line must, by rule, line up behind the line of scrimmage and establish a set position (one hand on the ground) before the ball is snapped. If a player moves even slightly after setting his position, an offsides penalty can be called. Offensive linemen are not allowed to handle the ball after being snapped, unless it is fumbled or deflected in the air. Play begins with the snap of the football from the center to the quarterback. The center is positioned on the offensive line between the two guards. Snapping the ball to the quarterback successfully and blocking are the center’s two biggest tasks on each play. The job of the center is to call out blocking assignments to the rest of the line, snap the football and block defenders. The offensive guards main duty is to block for the play that is called in the huddle. Occasionally, a pulling guard will come out of his position to take the lead role in blocking for a play. On each end of the offensive line is the tackle position. They are responsible for blocking on passing and running plays like their offensive line counterparts. However they have the demanding requirement of being the defenders of outside rushers (often superior athletes) coming after the quarterback. The ability to protect a quarterback’s blind side is especially prized in college football and the NFL. The left tackle position usually requires the most physically gifted and skilled offensive lineman on the team. The left tackle’s role in pass blocking is critical because of the QB’s blind spot. The specialized group of players used for kicking plays are known as special teams. This unit of the football team consists of backup players, starters and specialists. The kicking unit is the specialized group of players who take the field for field goals, extra points and kickoffs. It consists of a kicker, long snapper and holder (for field goals and extra points), as well as standard offensive line positions. The kicker uses his leg to kick the ball in three different situations: kickoffs, field goals and extra points. For kickoffs, the ball is usually kicked from a tee that holds the ball in a stationary, upright position. In bad weather or high winds, the kickoff tee may not be suitable to hold the ball. In such cases, a holder may be used. For field goals and extra points, the holder sets up 7-8 yards from the line of scrimmage. He receives the snapped ball. The holder catches the ball from the long snapper (a specialized center position) and places the ball with one end of the football on the turf and places a finger on the opposite end to stabilize the ball for the kicker. Typically, a player with good hands is employed as the holder in kicking situations, like a quarterback or punter. Some of the fastest players on the team are used as returners. They have good hands for catching a kicked ball without bobbling or fumbling it. Depending on variable factors like wind and ball spin, a kicked football can behave quite unpredictably. If a kick returner receives the ball in the end zone, he may choose to down the ball instead of running it out by putting one knee on the turf. The offense then takes possession at it’s own 35 yard line. If a punt returner feels pressure from the opposing team collapsing on him after the ball is punted, he can raise his hand in the air to signal a fair catch. When a fair catch is called, opposing players are not allowed to tackle the returner without being penalized. The offense then starts at the point on the field that the fair catch was made. When an offense has reached fourth down and is short of the line to gain, they can chose to punt the ball to the opposing team instead of going for a first down. At this point the punting team comes out on the field. The punter receives the snapped football directly from the center, about 15 yards from the line of scrimmage. He then typically tries to kick it to the awaiting punt returner downfield. On kickoffs, gunners are players who specialize in running downfield to tackle the kick returner. They are usually able to do so before others are able to get there. A jammer is a player who is lined up across from a gunner. He attempts to slow down his progress and give the kick returner more time to run.